Address on Industrial and Social Movements at Evening Session. 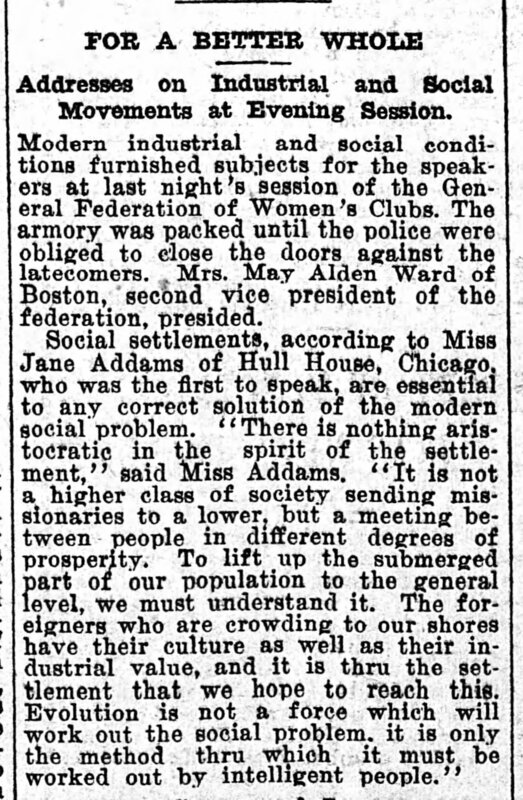 Modern industrial and social conditions furnished subjects for the speakers at last night's session of the General Federation of Women's Clubs. The armory was packed until the police were obliged to close the doors against the latecomers. Mrs. May Alden Ward of Boston, second vice president of the federation, presided. Social settlements, according to Miss Jane Addams of Hull House, Chicago, who was the first to speak, are essential to any correct solution to the modern social problem, "There is nothing aristocratic in the spirit of the settlement," said Miss Addams. "It is not a higher class of society sending missionaries to a lower, but a meeting between people in different degrees of prosperity. To lift up the submerged part of our population to the general level, we must understand it. The foreigners who are crowding to our shores have their culture as well as their industrial value, and it is [through] the settlement that we hope to reach this. Evolution is not a force which will work out the social problem, it is only the method [through] which it must be worked out by intelligent people." 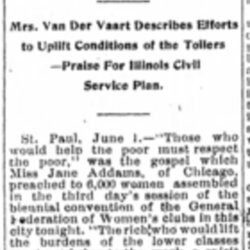 Clubwomen in All Civic Improvements, Minneapolis Journal, June 2, 1902. 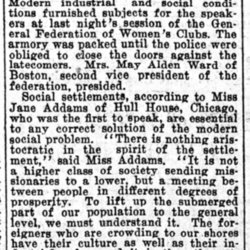 Addams, Jane, “Settlement Work, June 1, 1906 (excerpt),” Jane Addams Digital Edition, accessed April 25, 2019, https://digital.janeaddams.ramapo.edu/items/show/8245.